← Why should Francis be judged differently from other men? Apparently, because he stands on an entirely different plane of being. Father Spadaro presents him as a sort of unmoved mover: “The Pope draws energy from conflict and sees that his actions upset them as a sign.” The driving force of the pontificate of #PopeFrancis manifests itself precisely in the paroxysm of the backlash that it generates and that is thrown at him, crossing over him without moving him. And Bishop Gustavo Carrara, whom Francis recently appointed auxiliary bishop of Buenos Aires, speaks directly of the pope as a divine manifestation: “I believe, this is a great moment: God’s spirit is embodying itself in Francis’s spirit, but not many comprehend this dimension.” Such statements are appalling. How can people in responsible positions, including a successor to the apostles, possibly speak in these ways about a man who has as many human limitations as others, and whose fundamental role is to pass down what he has received? The document is called, sure enough, “Instrumentum laboris,” working instrument, and it is the outline for the discussion to follow. Which for that matter has already begun, with strong criticisms that have been focused precisely on the formulation of this preparatory text. 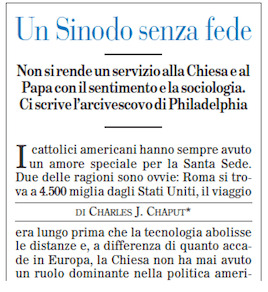 These criticisms have been voiced above all by the archbishop of Philadelphia, Charles J. Chaput, elected by the previous synod from among the select intercontinental group of bishops charged with organizing the current synod. Here are a few of the passages. We might have to ride this out until the end when he gets shot. With both guns and bows and arrows. He could be the bishop in white. The Fatima children saw a bishop in white who they “thought” was the pope. Jacinta had actually seen the “Holy Father” so I wonder why they just ‘Thought” it was the Holy Father. They said ‘Bishop’ too. He is the Bishop of Rome. (??) Anyway, ISIS is now practicing the art of shooting with bows and arrows. God help us all!